All of the proceeds raised for Mother’s Day florals will be donated to the Alzehimer’s Association! Order will will be ready for pick-up on 5/11 or 5/12! or $20 for delivery in the Savannah area! Spend a wonderful Mother’s Day with us with a morning full of brunch, coffee, mimosas, live music and fundraising! We will be teaming up to raise money for BABC, collecting wedding gown donations and informing individuals on breast cancer awareness and prevention. The Ivory & Beau floral shop will also be selling unique and handcrafted Mother’s Day bouquets to help raise funds for the Alzheimer's Association. Come out, enjoy some amazing food and spend some time with your Mom to help raise money for some incredible organizations! Modehaus gowns are hand made for the bold and exceptional bride. Each gown is meticulously crafted with luxurious fabrics. Our boss lady Nicole Mason will be a featured dancer in the 2019 Dancing Stars of Coastal Georgia competition that benefits the Alzheimer’s Association! Please feel free to donate by clicking here even just $1.00 helps! Here are just a few of the beautiful gowns we’ll have here at Ivory and Beau for a few weeks!! 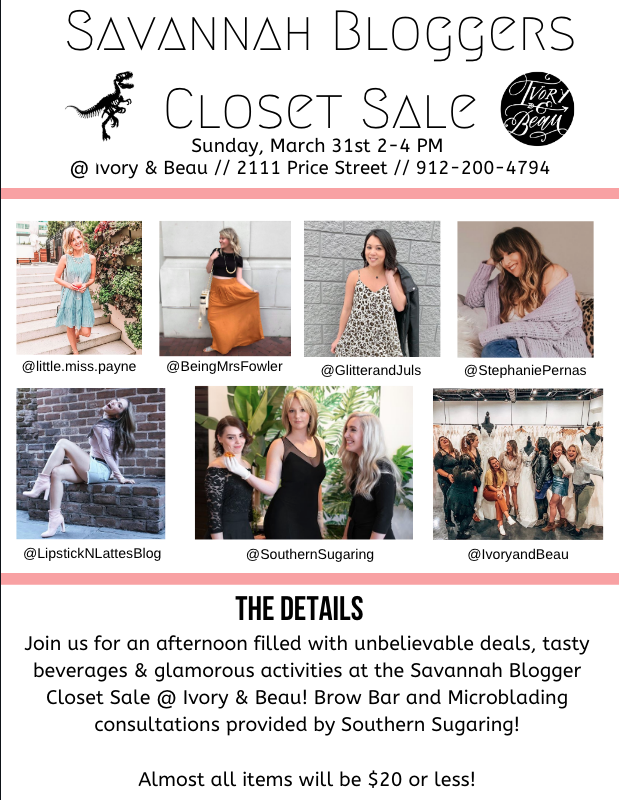 Join us for an afternoon filled with unbelievable deals, tasty beverages & glamorous activities at the Savannah Blogger Closet Sale @ Ivory & Beau! Brow Bar and Microblading consultations provided by Southern Sugaring! We are so excited to be a part of the Southern Women’s Fashion Show 2019! Ivory & Beau’s show will be held at 11 AM! Buy your tickets here to watch the Ivory & Beau gowns slay all the way down the aisle! We are honored to be nominated for the 2019 Savannah Morning News Best of the Best Contest! For both Best Wedding Planner & Best Bridal Shop and we are so so excited! You can show Ivory & Beau some love in both categories by clicking here! We are so incredibly excited to announce that we are hosting a Willowby trunk show starting March 4th!! We cannot wait to have these gorgeous gowns in house. Here’s a sneak peek of the dresses we’ll have in the store for three weeks! We’ll have 6 of the Willowby gowns here: Galatea, Esperance, Philomena, Lief, Daylily, and Woodrose, and we are THRILLED!! Exude an aura of romance on your wedding day in a gown that resonates with relaxed elegance and projects an image of exciting, effortless beauty. These irresistible wedding dresses exemplify Bohemian chic combined with vintage inspiration. This label is perfect for brides seeking a romantically flowing gown or bridal separates that showcase insouciant charm and a breezy, uncomplicated look. This collection is designed with modern weddings in mind and the dresses are ideal for beach weddingsand destination weddings, garden ceremonies and intimate venues. Book your appointment now to try on these insanely beautiful gowns! shape to the curves she loves. Love Me True is uniquely positioned to help these lovely ladies because our design process is collaborative; with constant consultation from the curvy women in our community. We truly care about our clients and we want them to be happy and feel incredible in their dress. This is the beginning of a beautiful endeavor and we appreciate their feedback to make this collection even better. Sizing and impeccable fit are a main focus with the Love Me True brand. The dresses are not just scaled up versions of a smaller collection; they are designed just for our brides from the very beginning of the process. The feedback from our clients serves as inspiration for the styles in the collection. Like all of our dresses, these are made ethically with high quality fabrics, in a waste conscious way. Sottero & Midgley's latest designs from the Ariya Collection are wonderfully romantic, featuring luxe fabrics and one-of-a-kind details. Expect to see the most modern cuts and daring styles! Maggie Sottero line is inspired by today’s classic bride. Their core collections feature shimmering embellishments and lightweight fabrics in a variety of captivating designs. Head to our blog to read more about the National Bridal Sale Event!!! You aren't going to want to miss this!